Alright guys and gals, now that you’ve seen the befores and afters from the kitchen and dining room it’s time to scope out the family room! 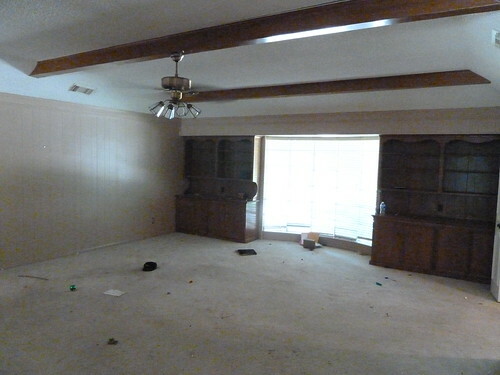 Here’s how the family room looked 2.5 months ago . . .
We kept the paneling for budget reasons and I’m actually really thrilled with how it turned out after some fresh paint! 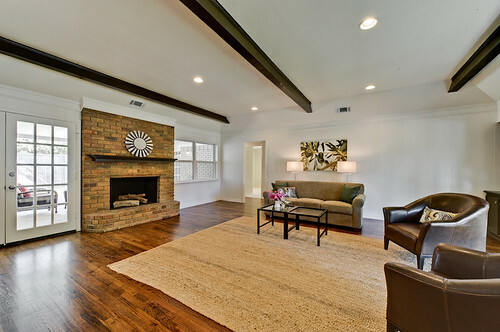 I personally really like the beams, but they were a little lacking in their medium-tone stain and that fan wasn’t helping matters . . .
. . . so we darkened the beams with brown paint (!) and brightened up the space with some recessed lighting. We also liked the brick fireplace and the set of French doors, so we kept those . . .
. . . but we installed new windows because the old aluminum ones left a little something to be desired. 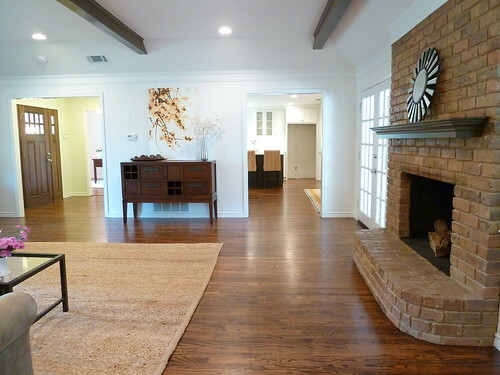 Hardwood floors instantly added some much-needed pizazz. There were bifold doors on the doorway to the hall as well as to the entryway, so we removed those to make the room feel a little more updated. Also, do you see those scallops on the built-in bookcases above? Those suckers had to go. We used the same staging furniture throughout the house that we bought for our last flip – luckily everything fit into this home perfectly! That’s it! 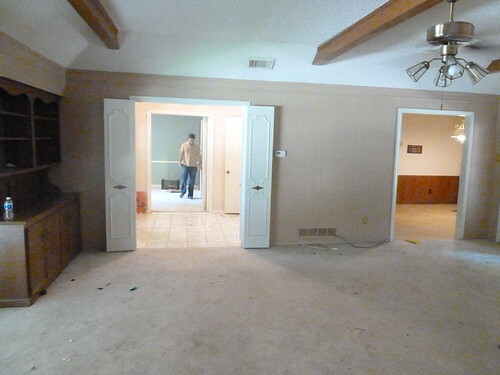 This is a giant room – I can imagine the new owners having lots of fun movie nights and having friends over. Can you? P.S. 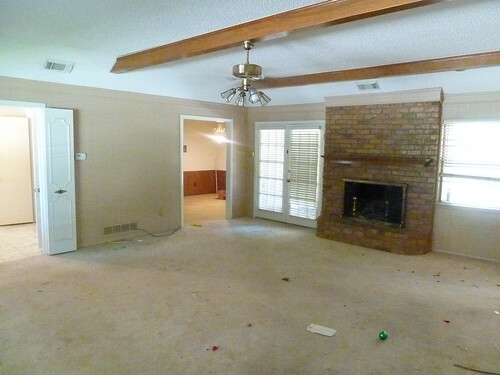 You can see more “before” photos of this flip here. Unbelievable! You guys should have your own tv show! 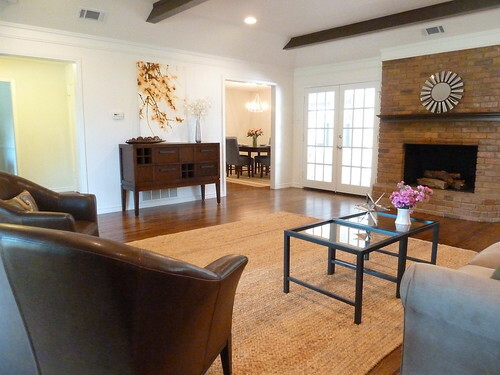 I LOVE LOVE LOVE it all, including the staging furniture! I can’t believe how effortless you make it all seem! Seriously, BRAVO guys!!! I love it, too! I am devouring these photos. Thanks, Liz! 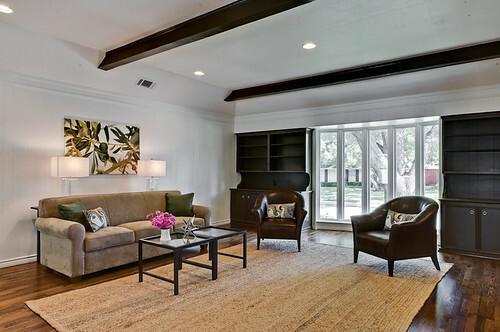 Love the beams and built-in bookcases – they add so much to the room. Awesome job!! I love every inch of the house. The interior design is outstanding! btw- Found your blog through a good friend of mine I think you know- Noelle G and I just love everything y’all are doing! I adore the flooring, too… please do share! The flooring is perfect. The beams look so much better in the darker brown! I hate to say it but I don’t know what the stain color is – I know, bad blogger!! The floor guys put out 3 samples on the floor and we picked the one with the least red in it. And you’re right, dark floors DO show everything! This floor has stayed looking amazing clean so far. looks like a wonderful room! terrific job! Liz, it looks absolutely TERRIFIC! The new windows and white paint make it all look totally new and fresh. Floor, of course, is fab. (Is there ever a time hardwood floors aren’t on an improvement on dreadful, dirty shag?) 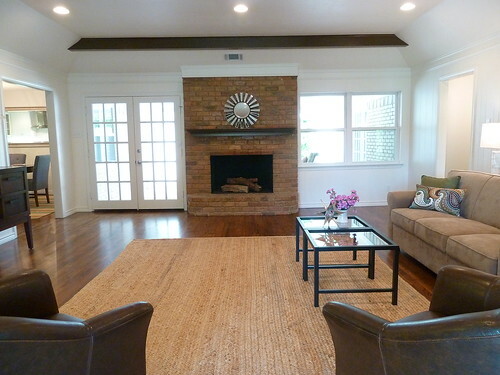 The darker mantle piece and beams look much better with the fireplace wall. I don’t remember the sofa table from your last flip staging, but the lamps add a lot to the sofa arrangement. I think your fairy godmother has lent you her magic wand. Super job! What did you use to paint your panelling? It looks very nice. We have some old, fake wood panelling we need to paint but are unsure how to go about it. Sherwin Williams primer and Sherwin Williams paint (2 coats)! Wow!!! great work! reminds me of our house that should go through a makeover as soon as possible! You do great work. Can’t wait to see the next one. 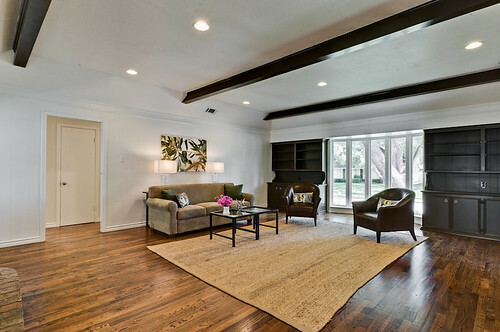 Hi, I’m new to your site and I am one of those paint haters most of the time but I do love the darker color on the beams. Really perks up the room. So glad you didn’t paint the beams white. And the other rooms are gorgeous too. Well done! Is it difficult to sell these homes after you’ve put so much into improving them? Anyway great post and wonderful site. Who wouldn’t love that brown paint? 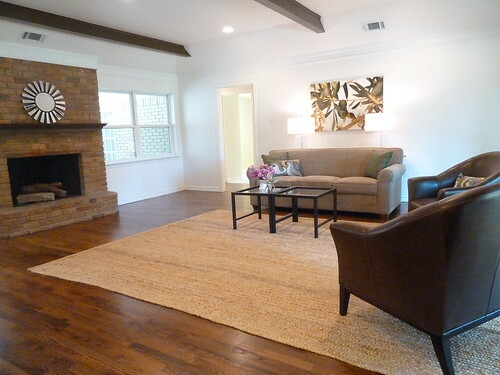 It really makes the beams pop and pulls the entire space together. You are awesome and have such impeccable taste. I love the dark beams! 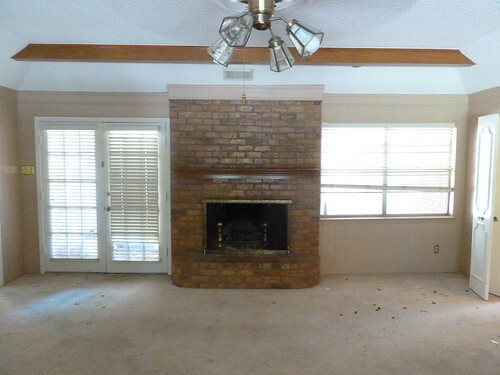 I also have a house (from the late 60s) with paneling and beams. Luckily the paneling was already painted a white color. Unfortunately, so have the beams. I have been really contemplating painting them a dark brown to make them pop. Or even a gray color. It’s like they were trying to hide the beams by painting the same color as the ceiling… um, hello, they are beams, you can’t hide them. So with the white walls, white ceiling, white beams, white blinds… it’s all very WHITE! I think painting the beams dark like you did and maybe getting some bamboo window treatments would help big time. Liz, did you guys do something to the fireplace bricks? For some reason it looks nicer/cleaner in the after pictures. Maybe the updated surroundings bring it out more? I definitely think the new, non-peachy paint helps a ton, and we also painted the mantel a dark brown color, cleaned out the fireplace (tons of ashes) and removed the fireplace screen. But that’s it! I think having recessed lighting in there really brightened things up a bunch, too. Its simply awesome. Thanks for sharing it with us. Hi! I have been spending waaaay too much time looking at all your flips tonight–but I couldn’t help it. You have such vision and style–and taste! Love these. Just wanted to let you know this post does not aoppear on the “table of contents” page for the flip. I found it via a link on the Before and after page for the Master Bath. You guys are inspiring. Good luck with the next one!